Hairy Biker Visits Cambridge Street! Dave Myers (one half of 'The Hairy Bikers' duo) came to visit our school! Since Dave Myers is a former pupil of Cambridge Street Primary, BBC's 'The One Show' wanted to film a feature of the TV chef taking a trip down memory lane at his old school. Despite arriving a little late, Dave turned up on his infamous motorcycle which he parked on our school playground - much to the delight of the pupils that spied it. Met by Mrs Lavery and a team of year 6 pupils, Dave and his crew first filmed a short scene in the hall and reflected on his memories of walking through the very same corridors as a child. Dave even brought with him an old school report to share with everyone. An Interview with Year 5. 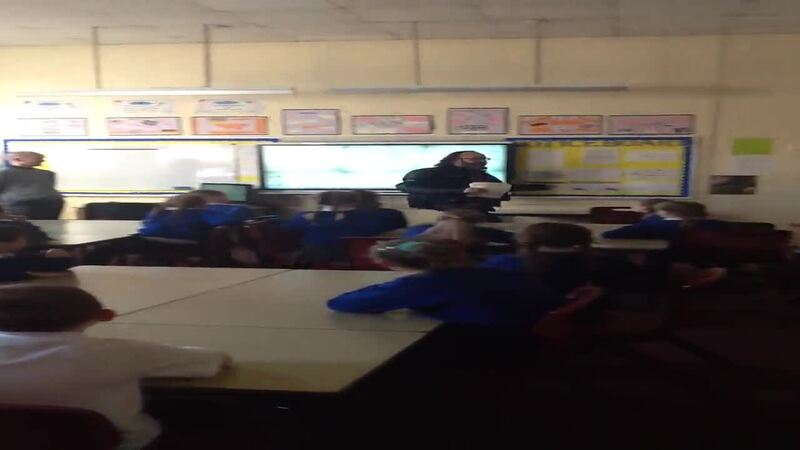 5W were lucky enough to ask Dave Myers questions as a segment was filmed in their classroom. It was reported that lots of scenes had to be filmed more than once from different angles - including Dave performing the Cha Cha Cha, a dance from his stint on 'Strictly Come Dancing'. 5W asked some incredible and thoughtful questions which Dave was more than happy to answer. A Slice of Humble Pie. How many schools can say that a TV chef has cooked in their kitchen? Dave Myers served up a lovely 'here's one I made earlier' cheese and potato pie in our school kitchens.